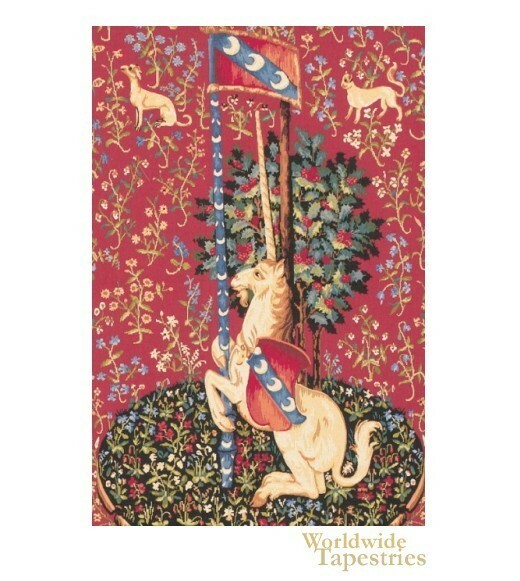 This tapestry "Unicorn Detail" shows a detail from the Lady and the Unicorn series of tapestries originally from the 15th century. The Lady and the Unicorn is a series of six tapestries created in Flanders and is one of the most impressive works from the Medieval period. Here we see a detail from one of the tapestries dedicated to one of the five sense, and shows the penant of Jean Le Viste, the nobleman of Charles VII who commissioned the work. We see the Mille Fleur design of this French style of tapestry with forest animals and flowers in the background. This unicorn tapestry "Unicorn Detail" is backed with a lining and has a tunnel for easy hanging.